Do you know, my fellow Internet consumer, what I really hate about 90% of the on-line product reviews? Do you know? How could you know? Do you even care? I hope you don't care. There are far more important things to care about, with some of them on the Internet, and some of them on some other places. But the uncertain fact is that 90% of the on-line product reviews are about rewriting product specification and going like "Supreme Quad Core CPU and 2GB DDR3 RAM speak for itself. This hardware configuration guarantees superior performance, and the 8000 mAh battery will last you a long time (which is longer then time, or some approximation of it), and Android 4.2 ensures great user experience and stuff." Do you care? Parrot cares. But, what about real life user experiences, what about using the tablet for some time, its behaviour, its feel, its... emotions? lol. What about user emotions? I am naturally talking about these emotions which wisely guide you through the process of throwing non-responsive things into hard concrete walls. 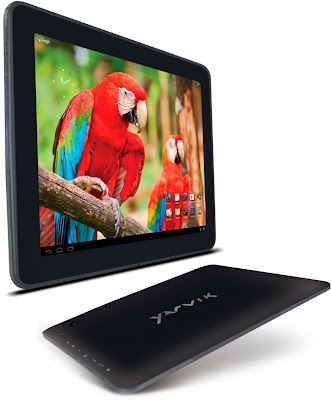 I was really excited when finally a tablet with great screen resolution and a fair price finally came to our market, and this tablet was called Yarvik, model name TAB09-211 Xenta 97ic+, intuitive and easy to remember. When I had Google Nexus 10, my friend was using some Yarvik model, and I was surprised to note that its construction and performances were pretty decent for the price. So I didn't use my usual research methods (which mostly include months of reading reviews on-line and undeciding things in panic), and bought it shortly after it came to the market. And then, I made a mistake: I turned it on. I could not believe that they were consciously putting these things on the market. I can not believe that some CIO, or CEO, or any C** from the Yarvik team has turned this tablet on, have been using it for more than 4 seconds, said "GOOD WORK GUYS, LET'S ROLL!" and actually released it to the market. I have already returned it, but I was not mad. I was seriously confused. Still am. And in the end, that it is a design flaw; which is absolutely delightful in every aspect. My personal favorite aspect: no firmware could probably ever fix this. It might have helped if I saw that earlier. But I probably still wouldn't believe until I witnessed it myself, and I would probably still have bought it. Lousy physical responsiveness of the touch screen. Giant monstrous charging adapter. It is hard to believe that they still make these monsters in the 21st century. No OTA (over the air) update. In other words, in some weird and unthinkable fairyland where firmware upgrades are a common practice, you would need to manually download new firmware, then install something on the PC, then click on some buttons, then realizing you have been clicking on the wrong buttons, then bricking the device, then throwing it away. Luckily, we don't live in this strange fairyland. You can't really use it on 2048 x 1536 resolution: serious screen flickering, unbelievably slow and unresponsive in any task. Crashes and freezes are like breathing to this thing. Wonderful solution management for high-resolution problems: drop down the resolution. Yes, and Yarvik team actually made a video for this mind-tricking process. Here is what I have wrote to them in response: http://forum.yarvik.com/forum/xenta-series/yarvik-xenta-general-discussion/3612-display-flickering/page2, post #19. I lied about being from Slovenia, but Yarvik also lied about 97ic+ being a good product. I am sure they will be crushed to the gutter and start making some serious remorse when they find out about this heinous deceit. For everyday dummy proof use, a disastrous user experience. Decision about buying something has never been clearer: Stay away from this useless piece of c*ap.